This post is in partnership with Worldcrunch, a new global news site that translates stories of note in foreign languages into English. The article below was originally published in Le Temps. Although he will continue to serve as Tibet's spiritual leader, the Dalai Lama is done with politics. He announced his retirement earlier this year. An international icon, the Dalai Lama no doubt leaves some very big shoes to fill. Who exactly will take on that tall task? Meet Lobsang Sangay, a former Tibetan Youth Congress leader who has spent 16 years in the United States. 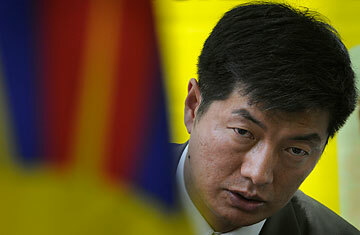 Just 42, Sangay was elected last month as the Kalon Tripa, or Prime Minister, of the Tibetan government-in-exile. Observers say he represents a new generation of Tibetan people who want more action to be taken to free Tibet. He'll have a chance to prove that, starting Aug. 14, when he is scheduled to join the exile government in Dharamsala, India. He spoke with Le Temps from Dharamsala. Le Temps: What kind of program did you present to be elected Prime Minister? Lobsang Sangay: The two key points are freeing Tibet and helping His Holiness the Dalai Lama return to Lhasa, Tibet's capital city. You are the first Kalon Tripa to be elected democratically and the first who has real influence. Will you be independent from the Dalai Lama, who remains Tibet's spiritual leader? His Holiness the Dalai Lama has been an excellent leader. He has governed us very well, and we are all indebted to him. There is no way I am going to replace him. Instead, I am going to try to make his vision of a secular democratic society come true. I will do my best to act as the new image and the new political spokesman for the Tibetan movement. You also represent the new Tibetan generation born in exile. Apparently, it has more fighting spirit than the generation that fled Tibet in 1959. Is there a generational conflict? I was elected with the support of both the older and new generations. The older Tibetans have said they have faith in the young generation. They have passed responsibility for continuing the movement down to us. As I represent this young generation, I want to respect this legacy. This election has sent a clear message to China: the movement is not going to be less influential just because it is led by the new generation. We will fight as long as necessary to free Tibet. Emotionally speaking, we feel as much attached to Tibet as does the older generation. We are still one single family. The majority of young people also voted for me. They want a more active leader. What do you mean by active? Anyone who takes action for Tibet must follow three principles: unity, innovation and autonomy. No matter what ideology he or she advocates, I will support their freedom initiatives  as long as they also push for unity, innovation and self-governance. For instance, the Tibetan Youth Congress organized a 25-day hunger strike in Delhi to protest a violent crackdown on a group of monastery monks. I went there and told them, "I'm on your side because you are fighting for Tibet, even if I don't fully agree with your ideology." But you asked them to stop that hunger strike. Yes. I told them they needed to think long-term. Putting the lives of the movement's leaders in danger will not bring about immediate results. Will you use the Internet more often? One of the first things I'm going to do will be to optimize our government's websites. We are going to use Facebook and Twitter and encourage the use of 21st century new technology. Have the Arab revolutions inspired you? Absolutely. Chinese hard power, its army, is strong. We are weak. But we are going to have an advantage in terms of virtual power. In terms of soft power, we are also strong, because we are advocating nonviolence. We are pacifists, and we are doing the Chinese no harm. How can you develop this virtual power in Tibet? Thousands of Tibetan people use their mobile phones every day and communicate with people living abroad. But the Chinese police have tapped their phones. That means we use another language, a secret one. We never say, "I'm working for the Tibetan government. I'm calling from Dharamsala." Instead we say, "I'm calling from the mountains. I'm from the place." What do you think of the Chinese? Have you met a lot of Chinese people while living in the United States? From a Buddhist point of view, nothing is permanent. Everything changes. China is changing with the world. Everybody is talking about China's economic development. But there are also new social networks that have been created. More and more people say what's on their mind. The taste of liberty is universal, and it is particular to man. I have Chinese friends from Harvard University I've known for 16 years. I organized seven conferences, and some of them brought the Dalai Lama together with Chinese researchers. As a researcher, I went to Beijing and to Shanghai in 2005. But I was denied access to Tibet. How are you going to negotiate with China? China does not recognize your government. Negotiations, which have been suspended, will continue with the Dalai Lama's special envoys. They are recognized by the Chinese government, so there's no problem there. No matter how negotiations restart, what really matters is the result, which is that we convey to China that we want real autonomy that respects the Chinese constitution. Have you ever managed to convince a single Chinese person that your cause is noble? Yes, but in private. Many recognize that there is something wrong. The problem is that the harshest members of the Chinese government think they must continue quelling every protest movement. That can work in the short term. But in the long term, that won't be possible. If China wants to become the next superpower, it cannot just be an economic and military power. It will also have to show moral leadership. As long as China oppresses the Tibetan people, that will be impossible. China questions the Dalai Lama's sincerity. The Communist Party thinks the Tibetan people are hiding something and that their true goal continues to be independence. And this is actually what many young people want. Do you think that autonomy is only the first step toward something else? Real autonomy is the official policy, and I support it. People can either believe it or choose to be suspicious. But if you are oversuspicious, that's endless. It means you can't trust anybody. Trust is a rational human feeling. When we are willing to take a step forward, we learn to trust each other. I have met with hundreds of Chinese people. It wasn't something I needed to do. And it was certainly risky. Some people criticized me for that. Some Tibetans thought I was mad to talk to them. Politically speaking, I lost votes. But when I say we need to talk with the Chinese authorities, I'm sincere. From Lithang, in eastern Tibet. Do you know people living there? Yes, and I'm always asking about what is going on there. China says you're telling lies, that the Tibetan people are happy. All you have to do is to allow international media, NGOs and tourists to enter Tibet to discover the truth. If it turns out that we are wrong [i.e., that Tibetans are happy, as the Chinese insist], we'll be glad to admit it. But the facts are that Tibet is occupied, oppressed, and that there is no freedom there.